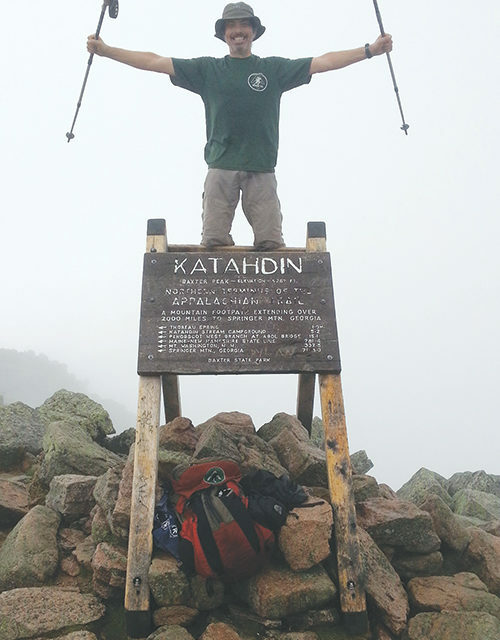 Warrior Hiker Rob Carmel stands at the northern terminus of the Appalachian Trail, Mt. Katahdin on September 13, 2013, mile marker 2185.9. Nature has the amazing ability to help cure the tragedies presented by life. Henry David Thoreau, Ralph Waldo Emerson, John James Audubon, William Blake, Ernest Hemingway, Thomas Jefferson, Theodore Roosevelt, Benjamin Franklin–thousands of writers and philosophers from every religion and every culture in the world have recognized the healing quality of the natural world. For Sean Gobin, a U.S. Marine Corps veteran of the wars in Iraq and Afghanistan, experiencing nature by hiking the 2,185-mile Appalachian Trail, inspired him to create the Warrior Hike Walk Off The War program. The Walk Off the War program provides veterans with the gear and supplies necessary to complete a six-month through-trail hike. Along the way, various veteran and community organizations provide overnight lodging off the trail, food, transportation, social and other events. The program does not end after the hike, Gobin said, adding that Warrior Hike also provides assistance in finding job opportunities offered by businesses and other groups supporting the program. Gobin, a second lieutenant who manned a tank during the assault of Baghdad, in March 2003, experienced war in all its forms, from 1994 to 2012, when he was deployed to Iraq two times; and once to Afghanistan. In 2012, Gobin returned home, left the military and began to renew his life as a civilian, by pursuing a Masters of Business Administration at the University of Virginia. Gobin said the idea of “walking off the war” as a mode of therapy can be traced to Shiloh, Pa. native Earl V. Shaffer, a World War II veteran who in 1948 made history by becoming the first person to hike the entire Appalachian Trail from Georgia to Maine–at the time experts did not believe it was possible to complete the hike in one season. Shaffer, who died in 2002, chronicled his experience on the trail in his first book: Walking With Spring. In 1965, Shaffer again made the record book when he became the first person to complete the Appalachian Trail hike in both Maine-to-Georgia and Georgia-to-Maine directions. In 1998, just two weeks before he turned 80, Shaffer completed his third complete hike of the trail. Gobin came up with the idea to hike the Appalachian Trail as a way to raise money for disabled veterans. Stopping at Veterans of Foreign Wars posts along the trail, Gobin collected $50,000 in pledges. While the program began with the Appalachian Trail, it has been expanded to include the 2,650-mile Pacific Crest National Scenic Trail running from the state of Washington, south to border of California and Mexico; and the 3,100 mile Continental Drive National Scenic Trail, which runs from Montana south to the border of Arizona and Mexico. Gobin said a cross-country bicycle program and a “paddle down the Mississippi River” program are being developed. Rob Carmel, a resident of Olympia, Wash., who was born in Baltimore, raised in Randalstown and has relatives in Sykesville, was one of 14 veterans who began the first official Warrior Hike in 2013 at Springer Mountain, Ga. Carmel, a sergeant major in the U.S. Army, who retired from the military after 32 years, decided to hike the Appalachian Trail. Two weeks before he planned to start, his wife, Catherine, learned about the Warrior Hike, and Carmel decided to give Gobin a call. From the time he began the hike at Springer Mountain, until he finished the journey at Mt. Katahdin, Carmel dropped 30 pounds, along with a lot of negative emotions connected to his military service. Carmel said that he will never forget his experiences in the military, but the hike offered him a new perspective on his life. During 20th-Century conflicts, beginning with World War I, a significant percentage of returning veterans carried that horror home with them. Terms for the condition have changed over the years – battle fatigue, shell shock syndrome. Following the Vietnam War, medical professionals had identified post-traumatic stress disorder, (PTSD), as a clinical condition involving a type of anxiety disorder that is triggered by extreme emotional trauma connected to the threat of injury or death. According to the U.S. Department of Veterans Affairs, more than 20 percent of returning veterans suffer from PTSD. Each day, 22 veterans commit suicide as a direct result of the stress and anxiety related to their war experiences. Since 2001, more than 2.5 million veterans have never successfully made the transition from military combat to peace at home. Maryland recognizes the role nature and “ecotherapy” play in helping wounded warriors, veterans and their families, said Christina Holden, coordinator of the Wounded Warrior and Veteran Outreach programs operated by the state parks system. Since 2011, five state parks in Maryland have operated programs specifically designed to accommodate both current and former members of the armed forces, and their families. Operation: Campout was the first state park program designed specifically to serve veterans, Holden said. The Maryland Park Service and the North Face: Explore Your Parks program offer camping gear free of charge to military members and their families. Pataspsco Valley State Park, which extends into southern Carroll County, along with Swallow Falls State Park, New Germany State Park, Rocky Gap State Park and Pocomoke River State Park participate in Operation: Campout. A section of the Appalachian Trail goes through Washington Monument State Park in Middletown. Holden said. In June, the park service and other supporters held a BBQ for the veterans who were hiking the trail under the auspices of Warrior Hike. It is an event the park service plans to continue, she added. For more information on Warrior Hike, visit www.warriorhike.org; for more information on the Appalachian Trail, visit www.appalachiantrail.org; for more information on Earl Shaffer, visit www.earlshaffer.com; and for more information on Maryland’s Wounded Warrior and Veteran Outreach program, visit www.dnr2.maryland.gov/publiclands/pages/armed_forces.espx.